Some books are just good reads. They are fun and entertaining, but without deep messages. Lawrence Watt-Evans writes these kind of books, and I thoroughly enjoy them. Other authors strive to reveal the meaning of the universe, with deep messages and philosophy, but they can't tell a good story. In trying to imitate James Joyce, they perhaps write a meaningful book, but one which is work rather than a pleasure to read. Mike Resnick bridges the gap and is able to write an engrossing tale which is wrought with meaning. My first Resnick book was Ivory, and to this day, it has had a significant effect on my outlook on life. Santiago, the penultimate space western, is another of my favorites. 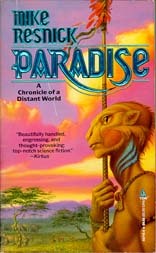 But Resnick's truth is perhaps most evident in Paradise, A Chronicle of a Distant World. Paradise is about Peponi, a distant world, rich in wildlife and populated by a people without a high degree of technology before it is "discovered" by mankind. Men arrive on the planet, then reap its riches. After years of subjugation, the natives finally begin to push for independence. While armed armed rebellion is put down, from its ashes a native leader, Bukon Pepon, is able to forge the various tribes together and gain independence from the Human government. Upon independence, most men leave the planet for distant shores and dream their dreams of the paradise that Peponi once was. Other men stay to create a new dream. But both men and pepons (the natives) watch their economy and resources dwindle away as overpopulation, hunting, tribal factionalism, and the introduction of non-native species their toll. Told through the eyes of Mathew Breen, a writer who has made a name for himself writing about the planet, we follow along Peponi's transformations. The book begins with an interview with August Hardwyke in his last years, one of the old-timers who remembers when Peponi when men first came, when he felt it truly was a paradise, wild and free. After his book about the early pioneers is successful, Breen interviews Peponi ex-patriots, men and women who lived through the native uprisings. To some of them, just prior to the fighting was when Peponi was a paradise. We follow Breen as he is invited to write the biography of President Bukon Pepon, and then when he returns yet 14 years later to see how far the planet has deteriorated. Paradise is about Peponi, but it is also about Kenya. Some of the characters, places, and wildlife in the book have obvious analogs in human history. The pepon leader Buko Pepon is Jomo Kenyatta and his successor, Nathan Kibi Tonka is Daniel arap Moi. The Republic's ex-secretary Jonathan "Johnny" Ramsey is Theodore "Teddy" Roosevelt. The Kalakala uprising is the Mau Mau uprising, Landships are elephants and demoncats are lions. But other analogies are not as evident except to people who have studied modern Kenyan and African history. Writing a novel with such strong analogies to history could easily result in a cumbersome, boring book. But Paradise is far from that. On the surface level, Paradise is a fun read. It is about hunting, war, vast lands, and people working together. I was taken back to reading as a kid about white hunters such as Osa and Martin Johnson and John A. Hunter. Resnick's style and storytelling ability put you in the bush, chasing a wounded thunderhead shot by a rich man's spoiled son. I was transported into the dense forests of Mt. Hardwycke trying to track down the Bogoda tribesmen carrying out the kalakala. On the deeper level, I fought against the path Resnick was taking. I did not want the mistakes made by the European colonial powers and the native Africans to be repeated on Peponi. As a child, my family sponsored a family of refugees from Uganda, and I did not want to see the same kind of exodus in this book. I did not want to see natural resources plundered and the land destroyed. I did not want to see famine and death as we've seen in Biafra and Ethiopia nor the ethnic cleansing as in Uganda and Burundi. But the book plows on, true to life and history. Paradise also works because Resnick resisted the opportunity to preach. Just as Breen is described as having been neutral in his retelling of the story or Peponi, so Resnick does not let his personal views on Kenya be known. Yes, he describes a spiraling downward trend in the quality of life of the people and the health of the planet, but he does not point fingers at any particular group. Are the colonial powers at fault for the decline of Peponi? Is it corrupt or inept native governments who are at fault? Is it some of both? Resnick presents a tale and then lets the reader come to his or her own viewpoint. On the surface level, for those who read to escape and to relax, Paradise fits the bill. You don't have to know African history to enjoy it. For those who want something more out of a book, Paradise also fits the bill. It will probably spark an interest in modern African history, and it will certainly get the reader thinking. There are two science fiction authors whose books I will buy and read just by seeing their name on the book cover. Mike Resnick is one of them (the other being David Brin). Paradise is a good example of I feel this way.